IN the last column, we looked at five methods for teaching English that have evolved over the last six or seven decades. This week, five more English teaching methodologies are considered: The Phonic Approach; The Whole Word – Look And Say Approach; The Presentation, Practice and Production (PPP) Method; The Grammar-Translation Method and The Lexical Approach. The Phonic Approach refers to an instructional method for reading and writing that involves teaching about the characteristics of and the relationship between particular sounds and symbols (letters) or symbol combinations (clusters). One characteristic of the English language is that symbols and symbol combinations can often make more than one sound. For example, “ch” makes four different sounds – as in cheese, chef, ache, and choir. Another characteristic is that different symbols and symbol combinations can make the same sound, for example the k… sound can be made by “c”, “k”, “q”, “ck” and “ch”. Phonics teaches how to decode or “target” words for pronunciation and for spelling and writing purposes. While different Phonics methods vary in what they teach, their commonality is their teaching of how the sounds and symbols of sub-parts of words are connected to form spoken and written words. The 4S Approach To Literacy And Language is also partly a phonic-based methodology, but it goes to greater literacy and language heights by focusing on the symbol combination-syllabic structure of words, on the relationship existing between words, on the multi-meaning attributes of numerous words in context, as well as on the provision of “Keys” for understanding pronunciation and spelling. The Whole Word – Look And Say Approach has been the predominant method used globally over the last fifty to sixty years to teach English. Simply put, the Whole Word – Look And Say method involves teaching learners to “sight read” words. Learners are taught to visually recognise and pronounce a whole word as a single unit. The rationale behind the method is the belief that language is best learnt as whole words in whole, meaningful text. Whole Word instruction involves the association of the name of a word with a single printed form. The learning procedure involves seeing the whole word in its written form, hearing the whole word spoken, seeing a pictorial representation of the word, and then encountering it in a sentence. By the repeated exposure to different words in this way, learners are expected to remember, read and use the words being taught. Critics argue that the Whole Word method relies too much on memory and fails to teach an understanding of why words are spoken or spelt the way they are. Further criticism centres on the lack of attention given to the sound and symbol combination attributes of words or the phonic, structural, root and function relationships that words can have. The Presentation, Practice and Production (PPP) method adopts a three-stage approach. Teachers firstly present the context and the language situation when the meaning and structural form of the new language components are explained and demonstrated. Secondly, learners use the new language contextually by practicing making sentences, both verbally and in writing. Learners do this in a controlled, directed way, using “models” to work from as required. It is at the third, production stage that learners are given the opportunity to be more creative in the application of what has been learnt, either working individually or in pairs. While many teachers use this method today, critics contend that the approach can lack flexibility and that lessons can become too teacher-centred. The Grammar–Translation method teaches learners to systematically find equivalent or similar words and grammatical concepts in sentences and word lists in their own native language and then translate them to the foreign language being learned, e.g. English, and vice versa. Teachers applying the Grammar–Translation Method need to be bilingual with a high level of proficiency in the native language. Some critics argue that the method can stifle learners from getting the kind of natural language input necessary to acquire the second language. The Lexical Approach contends that the knowledge of words and phrases is a far better foundation on which to build to acquire a “new” language than learning grammatical structure. An advantage of the Lexical Approach is the emphasis that is usually given to the study of Lexemes – the fundamental units of English. Learners are taught how an English word can sometimes represent one or more than one Lexeme. For example, “oxygen” = one Lexeme, which means the word has one meaning and one use in all contexts — it is a colourless, odourless gas. But “bank” has more than one Lexeme — it could mean a bank of computers, an investment bank, the bank of a river, and so on. In the next column, we will take a look at the 4S Approach To Literacy And Language Methodology. by Keith W, Wright, the author and creator of the 4S Approach To Literacy and Language (4S) — a modern, innovative and proven method of accelerating the learning of English. He is also the Director of International Language Academy. The 4S methodology and the associated Accelerated English Program (AEP) mentioned in this fortnightly column are now being used internationally to enhance the English language proficiency of people from a diverse range of cultures and with different competency levels. contact@4Sliteracy.com.au for a free 4S chart, The “or..” Sounding r- Combinations. KUALA LUMPUR : Laugh even if you have to fake it, to create that “feel good” high and immunity boost to fight disease and maintain good health. The saying “laughter is the best medicine” is now being taken literally by the health- minded, causing a growing worldwide popularity of laughter therapy. The therapy is seen as a much needed intervention, especially going by studies which show that today’s overstressed adults only indulge in a daily average of 14 laughs. It has been recorded that a child laughs about 400 times a day. Participants of the Cancerlink Foundation’s Cancer Care Givers’ Conference yesterday learnt about the potency of this positive emotional outburst from international laughter coach Jeya Jeyaratnam. The participants, comprising individuals who have volunteered to be the caregivers of cancer-stricken loved ones or friends, found this was just the right tonic for their wards and themselves. Cancerlink Foundation board of trustees chairperson Joanne V. Fernandez said studies had shown that when a person was made to laugh, his or her immunity system received a major boost. “This is especially pertinent for cancer patients considering studies have revealed that many forms of cancer are caused by a weak immunity system,” she said. Meanwhile, Jeya when contacted, said the group of 80 caregivers who attended her laughter workout session yesterday had thoroughly enjoyed themselves. Jeya, who had started out as a fitness and personal development trainer based in the United Kingdom, had studied laughter therapy, a system developed by Dr Madan Kataria of Mumbai, India, in 1995 from a practitioner in London. There’s the boss who tells everyone to stay late, and then leaves promptly at 5:00 p.m. to go golfing. There’s the supervisor who criticizes everyone for spending time on the Internet, but is discovered buying groceries online in the middle of the afternoon. And the CFO who recommends layoffs to stop “unnecessary spending,” but then buys herself brand-new luxury office furniture. There’s hardly anything worse for company morale than leaders who practice the “Do as I say, not as I do” philosophy. When this happens, you can almost see the loss of enthusiasm and goodwill among the staff. It’s like watching the air go out of a balloon – and cynicism and disappointment usually take its place. No matter what the situation is, double standards – witnessing people say one thing, and then doing another – always feel like betrayals. They can be very destructive. If this ever happened to you, you can probably remember that sense of disappointment and letdown. If you’re in a leadership position, then you know that you have a responsibility to your team. They look to you for guidance and strength; that’s part of what being a leader is. And a big part of your responsibility is to lead them with your own actions. So why is it so important to lead by example; and what happens when you don’t? Although Gandhi’s situation is very different from yours, the principle is the same. When you lead by example, you create a picture of what’s possible. People can look at you and say, “Well, if he can do it, I can do it.” When you lead by example, you make it easy for others to follow you. Look at legendary businessman, Jack Welch of General Electric. Welch knew that to push GE to new heights, he had to turn everything upside down. So that’s just what he did. He developed the whole idea of a “boundaryless organization.” This means that everyone is free to brainstorm and think of ideas – instead of waiting for someone “higher up” in the bureaucracy to think of them first. He wanted his team “turned loose,” and he promised to listen to ideas from anyone in the company. And he did. Everyone from the lowest line workers to senior managers got his attention – if they had something to say or a new idea that might make the company better. It wasn’t just “talk,” and it didn’t take his team long to figure that out. We’ve seen just how powerful it can be to lead by example. But what happens when you don’t follow this rule? How does your team feel when you tell them to do one thing, and then you do the exact opposite? As we said earlier, if this ever happened to you, then it shouldn’t be hard to remember how angry and disappointed you were. Do you think that Alexander the Great’s soldiers would have fought so hard for him if he had sat on top of a hill, safe from the battle? Probably not. He would have been just another average general in our history books, instead of the example of a successful leader that we know today. And so it is with your team. If you say one thing and do another, they likely won’t follow you enthusiastically. Why should they? Everything you tell them after that may meet with suspicion and doubt. They may not trust that you’re doing the right thing, or that you know what you’re talking about. They may no longer believe in you. Good leaders push their people forward with excitement, inspiration, trust, and vision. If you lead a team that doesn’t trust you, productivity will drop. Enthusiasm may disappear. The vision you’re trying so hard to make happen may lose its appeal, all because your team doesn’t trust you anymore. Good leadership takes strength of character and a firm commitment to do the right thing, at the right time, for the right reason. This means doing what you say, when you say it. If your team can’t trust you, you’ll probably never lead them to greatness. Leading – and living – by example isn’t as hard as it might sound. It’s really the easiest path. If your team knows that you’ll also do whatever you expect from them, they’ll likely work hard to help you achieve your goal. Understanding Workplace Values Around the World. We know we are living in a global age. Technology has brought the world much closer together. This means that people of different cultures find themselves working together and communicating more and more. This is exciting and interesting, but it can also be frustrating and fraught with uncertainty. How do you relate to someone of another culture? What do you say, or not say, to start a conversation off right? Are there cultural taboos you need to be aware of? Building connections with people from around the world is just one dimension of cultural diversity. You also have issues like motivating people, structuring projects, and developing strategy. What works in one location may or may not work somewhere else. The question is, “How can I come to understand these cultural differences?” Are we relegated to learning from our mistakes or are there generalized guidelines to follow? Fortunately, a psychologist named Dr Geert Hofstede asked himself this question in the 1970s. What emerged after a decade of research and thousands of interviews is a model of cultural dimensions that has become an internationally recognized standard. With access to people working for the same organization in over 40 countries of the world, Hofstede collected cultural data and analyzed his findings. He initially identified four distinct cultural dimensions that served to distinguish one culture from another. Later he added a fifth dimension and that is how the model stands today. He scored each country using a scale of roughly 0 to 100 for each dimension. The higher the score, the more that dimension is exhibited in society. Armed with a large database of cultural statistics, Hofstede analyzed the results and found clear patterns of similarity and difference amid the responses along these five dimensions. Interestingly, his research was done on employees of IBM only, which allowed him to attribute the patterns to national differences in culture, largely eliminating the problem of differences in company culture. 1. Power/Distance (PD) – This refers to the degree of inequality that exists – and is accepted – among people with and without power. A high PD score indicates that society accepts an unequal distribution of power and people understand “their place” in the system. Low PD means that power is shared and well dispersed. It also means that society members view themselves as equals. Application: According to Hofstede’s model, in a high PD country like Malaysia (104), you would probably send reports only to top management and have closed door meetings where only a select few, powerful leaders were in attendance. Large gaps in compensation, authority, and respect. Supervisors and employees are considered almost as equals. Involve as many people as possible in decision making. 2. Individualism (IDV) – This refers to the strength of the ties people have to others within the community. A high IDV score indicates a loose connection with people. In countries with a high IDV score there is a lack of interpersonal connection and little sharing of responsibility, beyond family and perhaps a few close friends. A society with a low IDV score would have strong group cohesion, and there would be a large amount of loyalty and respect for members of the group. The group itself is also larger and people take more responsibility for each other’s well being. Application: Hofstede’s analysis suggests that in the Central American countries of Panama and Guatemala where the IDV scores are very low (11 and 6, respectively), a marketing campaign that emphasized benefits to the community or that tied into a popular political movement would likely be understood and well-received. High valuation on people’s time and their need for freedom. An enjoyment of challenges, and an expectation of rewards for hard work. Encourage debate and expression of own ideas. Emphasis on building skills and becoming masters of something. Harmony more important than honesty. Show respect for age and wisdom. Suppress feelings and emotions to work in harmony. Respect traditions and introduce change slowly. 3. Masculinity (MAS) – This refers to how much a society sticks with, and values, traditional male and female roles. High MAS scores are found in countries where men are expected to be tough, to be the provider, to be assertive and to be strong. If women work outside the home, they have separate professions from men. Low MAS scores do not reverse the gender roles. In a low MAS society, the roles are simply blurred. You see women and men working together equally across many professions. Men are allowed to be sensitive and women can work hard for professional success. Application: Japan is highly masculine with a score of 95 whereas Sweden has the lowest measured value (5). According to Hofstede’s analysis, if you were to open an office in Japan, you might have greater success if you appointed a male employee to lead the team and had a strong male contingent on the team. In Sweden, on the other hand, you would aim for a team that was balanced in terms of skill rather than gender. Men are masculine and women are feminine. There is a well defined distinction between men’s work and women’s work. Be aware that people may expect male and female roles to be distinct. Advise men to avoid discussing emotions or making emotionally-based decisions or arguments. Powerful and successful women are admired and respected. Avoid an “old boys’ club” mentality. Ensure job design and practices are not discriminatory to either gender. Treat men and women equally. 4. Uncertainty/Avoidance Index (UAI) – This relates to the degree of anxiety society members feel when in uncertain or unknown situations. High UAI-scoring nations try to avoid ambiguous situations whenever possible. They are governed by rules and order and they seek a collective “truth”. Low UAI scores indicate the society enjoys novel events and values differences. There are very few rules and people are encouraged to discover their own truth. Very formal business conduct with lots of rules and policies. Sense of nervousness spurns high levels of emotion and expression. Be clear and concise about your expectations and parameters. Plan and prepare, communicate often and early, provide detailed plans and focus on the tactical aspects of a job or project. Express your emotions through hands gestures and raised voices. More concern with long term strategy than what is happening on a daily basis. Accepting of change and risk. Do not impose rules or structure unnecessarily. Minimize your emotional response by being calm and contemplating situations before speaking. Express curiosity when you discover differences. 5. Long Term Orientation (LTO) – This refers to how much society values long-standing – as opposed to short term – traditions and values. This is the fifth dimension that Hofstede added in the 1990s after finding that Asian countries with a strong link to Confucian philosophy acted differently from western cultures. In countries with a high LTO score, delivering on social obligations and avoiding “loss of face” are considered very important. Family is the basis of society. Parents and men have more authority than young people and women. High value placed on education and training. Do not display extravagance or act frivolously. Reward perseverance, loyalty, and commitment. Avoid doing anything that would cause another to “lose face”. Expect to live by the same standards and rules you create. Do not hesitate to introduce necessary changes. Cultural norms play a large part in the mechanics and interpersonal relationships at work. When you grow up in a culture you take your norms of behavior for granted. You don’t have to think about your reactions, preferences, and feelings. When you step into a foreign culture, suddenly things seem different. You don’t know what to do or say. Using Hofstede’s Cultural Dimensions as a starting point, you can evaluate your approach, your decisions, and actions based on a general sense of how the society might think and react to you. Of course, no society is homogenous and there will be deviations from the norms Hofstede found, however, with this as your guide you won’t be going in blind. The unknown will be a little less intimidating and you’ll get a much-needed boost of confidence and security from studying this cultural model. PUTRAJAYA : Malaysian polytechnics are a step closer to shedding their image of being a “dumping ground” for students who do not make the cut for entry into colleges and universities. Three of the institutions were upgraded by the Government to premier polytechnic status and there are plans to upgrade others further to university level by 2015. The premier polytechnics are Malaysia’s first polytechnic Politeknik Ungku Omar in Ipoh (Perak), Politeknik Salahuddin Abdul Aziz Shah in Shah Alam (Selangor) and Politeknik Johor Baru (Johor). The upgrade sets the momentum for polytechnics nationwide to undergo a major revamp under the Higher Education Ministry’s Polytechnic Transformation Plan. As part of the transformation plan, the three institutions will be granted high levels of autonomy and their focus would be in areas that support the service industry. The plan was launched here yesterday by Deputy Prime Minis­ter Tan Sri Muhyiddin Yassin, who said that it was part of the Govern­ment’s effort to transform Malay­sia’s education system from pre-school to higher education. “I believe this plan is an important effort to improve the quality of vocational and technical education in Malaysia,” he said in his speech. Muhyiddin added that with the national economy becoming more service-based, polytechnic programmes must address the changes by offering courses in areas such as digital animation, design, finance and nanotechnology. Higher Education Minister Datuk Seri Mohamed Khaled Nordin said that certificate-level courses would no longer be offered from the July 2010 intake as part of moves to improve the quality and image of polytechnics. Mohamed Khaled added that the transformation plan aimed to make polytechnics a preferred choice for students. To uphold quality, premier poly­technics would be benchmarked against renowned technical institutions such as the Faschoschule in Germany and its counterparts in Austria, Sweden, Finland, Norway and France. Imagine you’ve recently started a new job as a team leader. At first, you’re completely overwhelmed with all there is to do. You’ve got to get to grips with the group’s objectives, assign tasks, keep everyone motivated, and adhere to a strict schedule. And that feels like just the tip of the iceberg! You also know that, under your predecessor, several of the team were struggling a little, so you devote a lot of your time to coaching these individuals. This seems to be working well, with the team members concerned growing in confidence as a result of your hard work. But after a few weeks, your start to realize that things are going badly wrong in other areas. The group isn’t working cohesively as a whole, and an unpleasant blame culture has sprung up amongst several team members. And an important deadline is missed. You’ve been so busy coaching people that you didn’t see these things till it was too late. Managing a team is very much like juggling several balls at once. Drop one ball, and it spoils the whole pattern. Unfortunately, this is an easy mistake for managers to make, as they spend too much time on one responsibility at the expense of others that are just as important. This is where a management model like Action Centered Leadership helps you monitor the balance between the key areas for which you’re responsible, helping you avoid dropping any balls along the way. In this article we’ll detail what Action Centered Leadership is, and how to use it with your team. 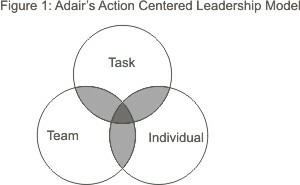 Action Centered Leadership (sometimes known as ACL) is a model that was first published in 1973 by leadership expert, John Adair. Task: Achieving the team’s goal. Team: Developing and building your team, so that it’s ever more effective. Individual: Helping individuals develop their full potential in the workplace. These areas are represented by the three interlocking circles, as shown in Figure 1 below. The model states that leaders must balance the actions they take across all three key areas if they want their group to succeed. The areas are interdependent; if a leader focuses too much on one area and neglects the other two, then the group will experience problems. The shaded areas in Figure 1 show where one element relies on one or both of the others for success. Imagine your team is working well together, and everyone has the skills to accomplish the final goal. However, there’s one team member who isn’t carrying his share of the load. He’s lacking motivation, and missing deadlines. The entire group’s morale starts to suffer because this one member is dragging down their productivity, and the team misses its deadline because he hasn’t finished his work. Here, issues with the individual are negatively affecting the task as well as the team. Alternatively, imagine what would happen if you didn’t articulate your team’s goal properly. Everyone may have great individual skills, and people may work really well together, but because no one is sure what they should be trying to achieve, progress isn’t being made towards your goal. In this example, both the individual and the team needs are being met, but task needs are being ignored. Because the group isn’t sure how to accomplish their task, they’re headed towards failure. Review the activities you’re carrying out for each of the three key leadership areas, and make sure that you’re dividing your time amongst all three appropriately. Here’s a list of common tasks for each of the three management responsibilities. You can use these as a guideline; and tasks can be added or eliminated based on your specific situation. Identify the purpose of the group, and communicate that purpose to all team members. Clearly state the final goal of the group. Make sure everyone understands the resources, people, and processes that they should be using. Establish deadlines for project tasks, and explain the quality standards you’re expecting. Create a detailed plan for how the group is going to reach their final goal. Make sure that everyone in the group has the skills and training to accomplish the final goal. If your team will be working in smaller groups, appoint a leader for each group, and make sure that he or she is effective and properly trained. Monitor group relationships, and resolve conflicts where necessary. Work on keeping the group motivated, and morale high. Give regular feedback on the group’s performance. Make sure that you spend some one on one time with each member of your group for assessment: identify their strengths and weaknesses, their needs, and any special skills they can bring to the group. Make sure each group member has the skills to perform his or her role successfully. Appropriately praise and reward individual team members for their contribution to the group. Help define each individual’s role within the group, and agree the tasks they’re responsible for. If any team members seem to be lagging behind, coach them until they’re back on track. Leaders have many responsibilities when it comes to managing their teams. And, it’s easy to get so focused on one area that the others slip by the wayside, leading to an unbalanced, poorly-functioning group. Using a tool like Action Centered Leadership can help any leader stay on top of the most important responsibilities, and keep the group working efficiently, happily, and productively. KUALA LUMPUR: Students will be able to remember their lessons better if provided a fun place to learn. This is the view held of Universiti Kebangsaan Malaysia Vice-Chancellor Tan Sri Prof Dr Sharifah Hapsah Syed Hassan Shahabudin, who believes that transforming the school curriculum to focus more on a fun environment would have lasting benefits for children. She said learning should not only be centred on passing examinations but also providing an environment that would make students enjoy what was being taught. Dr Sharifah added that pupils should be taught to do activities together. Teachers, too, have to move away from the traditional classroom-centred teaching methods. Dr Sharifah said there should be less focus on pushing for straight As. “If the reward is for the most number of As, then teachers will work towards that. For this to take off, Dr Sharifah believed that there should be a solid support system from the schools and the government. As a leader, giving people the gift of not just our appreciation for good work, but our genuine admiration for their talents, is generosity of spirit at its pinnacle. This is the difference between saying to someone: “Great job” versus “This was pure genius;” or “I appreciated your help” versus “I couldn’t have done it without you.” When it comes to genuine praise, like the sun at high noon, give resplendently. When you see good work, say it, and say it from the heart, just as you thought it. Free up the thought, and let it breathe – let it fly out there in the form of generous words, and watch what you get back. Giving is ultimately sharing. In Adele Lynn’s book, In Search of Honor: Lessons from Workers in How to Build Trust, we learn that 55% of workers value “giving people a sense of importance” as the number one item for building trust in the workplace. Consider what small actions you could take intentionally today to make people feel that the work they do is important, and that they themselves, as people, are important to your team. Give feedback, not criticism.If giving frequent criticism is your style of management, consider some of these questions: Is your motivation genuine, or is it to gain points? Are you picking the right moment? Are you stopping to reflect how you might deliver the feedback while still honoring the other person? Giving people visibility in your organization is a special gift we bestow to help others shine and grow. I encourage you to think how you might give people more access to senior executives, and more access to your boss. Consider as well that people like to know that their boss’s boss knows the great contributions they made to a project, or about their significant effort in writing a report that does not bear their name. Knowing that our leader is representing us well to upper management is a high-octane motivator, and engenders fierce loyalty. Resolve to become a philanthropist of know-how. What knowledge, expertise, or best practices can you share with others as a way to enrich them? For inspiration, read about other leaders who practice teaching in their organization for everyone’s benefit – for example, Jack Welch, whose calendar was filled with hundreds of hours spent teaching thousands of GE managers and executives at the company’s training center at Croton-on-Hudson; or the ex-CEO of Intel, Andy Grove, who devoted considerable amounts of time to teaching newly hired and senior managers his philosophy on how to lead in an industry where innovation goes stale very quickly. Public speaking is known to be among the greatest fears experienced by millions of people. The next time you attend a presentation given by an apprehensive team member, practice giving them moral support. The simplest of generous acts are abstaining from checking your Blackberry, giving the odd nod in agreement, and practicing looking with kind eyes. Finally, take some inspiration from Walt Whitman’s beautiful words: “The habit of giving enhances the desire to give.” Giving is like building a muscle. It requires practice and persistence – once it becomes habitual, you will emerge as a stronger leader. “To see things in the seed, that is genius”, said Lao-tzu, Chinese philosopher. This is what we now refer to as Appreciative Intelligence, a term coined by Tojo Thatchenkery to describe the capacity by certain individuals to see the positive inherent potential of situations or people – it is the ability to see a breakthrough product, top talent, or valuable solution of the future that is not readily visible in the present situation. In short, it is the ability to see the mighty oak in the acorn. The term originated when the author began studying the explosive entrepreneurial growth in Silicon Valley in the late 1990s. According to the author, it is appreciative intelligence that allowed, partly, for so many highly talented immigrants from different countries to assemble in the area and flourish. As the author puts it, venture capitalists looking to fund the right ideas were asking the question, “How can I make this work?” as opposed to “What are the chances this idea will fail?” They created an environment of high anticipation of positive results which became a contagious fever of opportunity, achievement, resilience and possibility recognition. (Appreciative intelligence is not to be confused with appreciative inquiry, which is an approach and methodology for analyzing organizations). Appreciative intelligence is a mental ability of individuals who have a knack for reframing situations (the glass half full/half empty) and a keen eye for spotting what’s valuable and positive in a situation or in people. And these individuals go one step further: they are able to envision how the positive aspects can be used to create a better future. Combining the two in an organization, i.e. a leader with appreciative intelligence using an appreciative inquiry approach, constitutes a powerful force indeed for effecting positive change and inspiring others to give the very best they have to offer. Imagine if all leaders in an organization proactively and mindfully practiced appreciative intelligence. Imagine the profound, healthy impact that this would have on an organization’s culture. Fairness : knowing that leaders ensure equal and fair distribution of rewards. Recognition and praise are indeed high octane fuel for the soul. When we receive a genuine compliment, we experience an inner glow – it’s a warm, magical feeling that makes us break into a smile. It makes us want to go the extra mile for the person who bestowed the sincere compliment. If this were not important to us, we would not be treasuring all of the mementos of awards, plaques, appreciative notes and emails, and other tokens of appreciation that we receive over the years. But intuitively, we all know that genuine appreciation is a key factor in our relationship with our constituents, and any basic management course will touch on the value of praising employees for their contributions. Yet many well-meaning and otherwise caring leaders are reluctant to express their appreciation of others’ talents and contributions. Many years ago, I worked for a great leader, one who genuinely cared for his constituents, and who confided in me one day that he found expressing praise a very difficult thing to do – publicly and even harder, privately. I asked him why that is. He said, “I grew up in a household where praising was not something we did.” There is a profound implication in this statement. Our families are our first corporations – that’s where we learned many of our behaviors, and it is often difficult to break these ingrained patterns. Withholding praise, however, is a pattern of behavior that we need to unlearn if we want to bring the best out in people. We need to get over the embarrassment that grips some of us when we have to praise an individual. If you have difficulty praising others, analyze the root causes of this. If it is a fear of embarrassing others, know that even the most introverted individuals who shun public praise enjoy reading an email to all staff about their contributions. If it is a discomfort at not knowing how to do it, read the few simple rules below and consider working with a coach for one or two sessions on this most important aspect of a leader’s communication repertoire. Self-awareness precedes self-management. Praise has a limited “best before” date. Don’t delay its expression or wait until performance review time – when you see something that is worthy of praising, do so promptly after the event. Make your genuine words memorable for your constituents by being specific about the achievement. Not many of us remember the perfunctory “job well done”, but we all would remember someone who tells us “This was pure genius,” or “I would have missed this if you hadn’t picked it up.” The praise does not have to be elaborate. It just needs to be genuine. When you drop by an employee’s office or cubicle to deliver the praise, don’t follow that with a conversation about business matters or other projects. Deliver the praise and leave. Come back later for discussions on other matters. This gives the praise its moment of honor and heightens its value in the eyes of the recipient. A primer for rewarding and recognizing others is Jim Kouzes’ and Barry Posner’s Encouraging the Heart: A Leader’s Guide to Rewarding and Recognizing Others. The book provides 150 ways to encourage the heart. Another useful book is Steven Kerr’s Ultimate Rewards: What Really Motivates People to Achieve (Harvard Business Review Book Series). The book outlines many different sources of motivation including accountability, responsibility, organizational culture, coaching, teamwork, incentives and goal setting. Finally, how can you apply the dynamic concept of appreciative intelligence on yourself? What are your talents? Practicing appreciating our talents and gifts opens us up to appreciating others’ greatness. Perhaps the ultimate appreciation is letting people know that their work – no matter how far removed they are from the top of the pyramid – is important to the organization. It’s about making everyone feel like an owner and helping them understand how their work contributes to the overall purpose of the company. It’s about practicing seeing more people. Excellence involves everyone. There is another lovely Chinese quote that says, “A bit of perfume always clings to the hand that gives roses.” As leaders, when we make people feel great about themselves, paradoxically we elevate ourselves to greatness as well. You are currently browsing the www.Teo-Education.Com blog archives for February, 2010.